The aim of the festival is to develop international co-operation, widening the scope of possibilities of utilization the valuable raw material by exchange of experiences and establishment of working relationships, renewal and further development of traditions of decorative-applied art, increase in the professionalism if the artisans who produce felt and products made of it. The first felt festival took place in Tuva in 2010 and brought a large number of participants and guests, as well as enthusiasts of the renewal of the felt-making traditions. Head of Tuva Sholban Kara-ool noted then, that the cultic material of nomadic nations is going through its second birth. "It is an excellent product from any point of view. It is ecological, simple, adaptable, multi-functional. Products made of it retain the warmth of the artisan's hands. Ethnographer Istvan Vidak once said: "To make felt, nothing else is necessary except human hands and wool. True, also a lot of work is needed", said Sholban Kara-ool. Production of felt and artifacts made of it is one of the oldest of subsistence activities of Central Asia nomads. The raw material of felt production was sheep, camel and goat wool. In the life of Tuvans, felt serves as an irreplaceable material for making of yurts, their interior furnishings and clothing. Felt is, in reality, one of the most international materials. In the life of a nomad, it is the yurt, a felt rug, horse-riding equipment and household furnishings. In Slavic culture, it means the famous Russian felt boots - "valenki". For Scandinavians, it is insulation of the sauna. In medieval Spain, they invented felt made of the fine wool of merino sheep, which allowed the production of more delicate, soft and esthetical material. 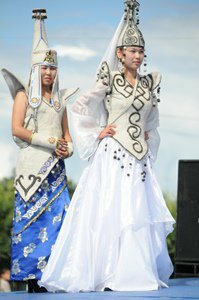 Remember that the Ministry of Culture of Tuva is the organizer of the contest,, with financial support of Ministry of agriculture and provisioning of the republic.